October 3rd – 13th, Art Gallery Week: Art Gallery Week will feature 36 internationally prominent Bay Area galleries located in San Francisco, Berkeley and Oakland and will offer a full spectrum of solo and group exhibitions as well as one-time cultural events, click here for a full schedule. Some highlights are: Saturday 10/6, 3:30 – 5pm Tour of East Bay Galleries starting at Creative Growth Art Center with guide Dena Beard, assistant curator at the Berkeley Art Museum. Saturday 10/13, 7 – 10pm Closing Party at Yerba Buena Center for the Arts featuring over 30 artists, performers and installations. Maps featuring the galleries participating in Art Gallery Week. October 6th & 27th, San Jose Institute of Contemporary Art’s Annual Art Exhibition and Auction, 560 South First Street San Jose: This is a great opportunity for art enthusiasts and collectors to view and purchase artwork by the Bay Area’s rising stars and celebrated artists. With both a silent and live auction, there’s a wide variety of styles and interests. View the exhibition of artworks up for auction September 29th – October 27th. Then attend the Silent Auction event on Saturday, October 6th from 5-7pm, free admission. The Live Auction Gala will be Saturday, October 27th starting at 7pm. For tickets to the gala purchase online here. October 10th, Mills College Art Lecture Series with John Chiara, 7pm: Chiara photographs cityscapes in a process that is part photography, part event and part sculpture – an undertaking in apparatus and patience. Many times this process involves composing pictures from the inside of a large hand-built camera mounted on a flatbed trailer to produce large scale, on-of-a-kind, positive exposures. This lecture is free and open to the public, and held in the Danforth Lecture Hall, Mills College, 500 MacArthur Blvd, Oakland. Watch KQED’s Spark on John Chiara, originally aired May 2006. 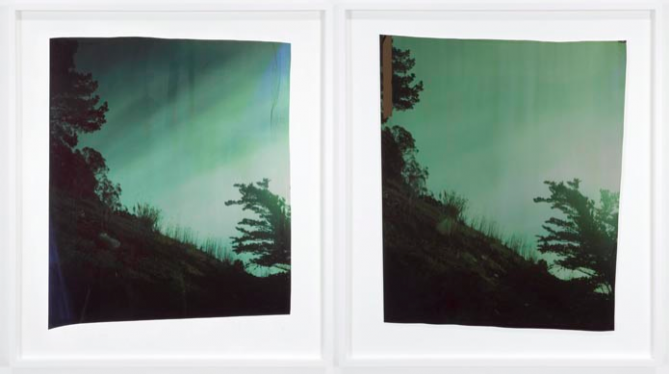 John Chiara, “Goldmine: Diamond: Coral” 2012, dye construction process, two unique photographs. Image courtesy of Haines Gallery.